Compact and cosmopolitan, New Zealand’s capital city is situated on the Southern coast of its North Island. Famous for its mouth-watering craft beers and legendary coffee, Wellington is home to a multitude of bars, restaurants and cafés in which to taste these delights. However, with its diverse landscape, historical draw and undeniable charm, the city’s appeal extends far beyond its culinary prowess. Discover it all with a luxury holiday in Wellington. Wander along Wellington’s scenic Waterfront, home to a great selection of parks, cafés and markets. For a taste of the country’s fascinating geological and cultural history, visit the Museum of New Zealand or ‘Te Papa’, where you can experience the simulated Earthquake House as well as examine the exquisite works of art and Maori artefacts on display. Learn about the city’s own intriguing development at the Wellington Museum, or tour the Weta Cave with its fantastic array of exhibits and props from the world of film. 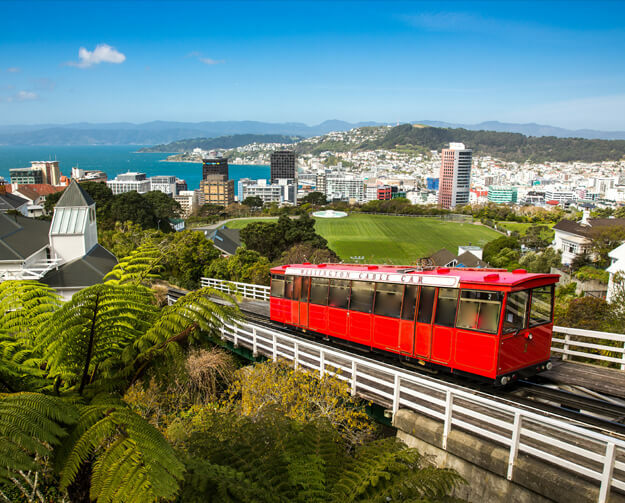 Ride the city’s cable car to Kelburn Lookout for stunning views across the city, before taking a stroll around the glorious Wellington Botanical Gardens nearby. Tour around the iconic Beehive building set in the pleasant parliamentary gardens, or take a trip to the dynamic and bohemian Cuba Street, with its quirky Bucket Fountain. The City Gallery Wellington is the city’s first exhibitions-focused public gallery, where you’ll find examples of contemporary art from around the world, while the New Zealand Academy of Fine Arts features pieces from local artists. Wellington is the perfect location from which to discover some of New Zealand’s far-famed nature and wildlife. Visit Zealandia, nestled in the hills to the west of the city, where you can spot some of the country’s endangered bird species, including the saddleback, takahe, hihi and kaka, together with the elusive kiwi. Explore some of the 32 kilometres of trails around the sanctuary and visit the modest museum to find out more about the country’s natural history. For a more interactive experience, head to Wellington Zoo, where you can hand-feed the giraffes and get close to the playful meerkats. If you’re feeling energetic, hike to the terrace at the summit of Mount Victoria, from where you can marvel at the magnificent panorama spread out below. Otari-Wilton’s Bush to the northwest specialises in native flora, harbouring more than 1,200 species of plant including an 800-year-old rimu tree. As well as plenty of nature trails, there’s a canopy walkway from which you can enjoy fabulous views across the gardens. Amidst the history and nature, don’t forget to spend some time at one of the region’s gorgeous beaches. Relax and unwind at the picturesque Oriental Bay, or visit Red Rocks Beach to see the amazing rock formations and attempt some seal-spotting. Explore the rock pools that pepper the sandy cove of Princess Bay, or admire the rugged scenery of nearby Houghton Bay. For the chance to do all this and more, our luxury holidays in Wellington will certainly not disappointed. If you’re looking for an unforgettable and indulgent holiday, you’ve come to the right place. Azure offers a wide range of luxury hotels in Wellington, so you’re bound to find something to suit your needs. Contact us today to find out more.